Everyone wants an osteoporosis definition when they first are given this diagnosis and are warned their bones are brittle. Many of us have heard the term, but are unsure how to exactly define osteoporosis or how to deal with it. 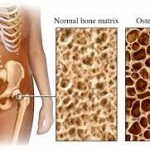 Besides, osteoporosis sounds scarey, and it is really some cause for legitimate concern. The concern is not that the problem is necessarily fatal or contagious. The reason to be most concerned about osteoporosis is that it can limit your enjoyment of life greatly and it can be very painful to deal with the broken bones that frequently occur as a result of osteoporosis. 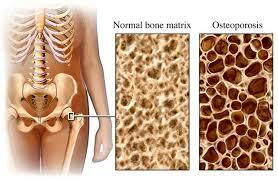 The word osteoporosis literally means “porous bones. ” But a more complete osteoporosis definition is that it is a medical condition of the skeleton in which bone tissue loses an excessive amount of protein and mineral content in general, and calcium in particular. Over time this loss of bone protein and minerals results in a loss of bone density. Therefore the bones become so weak that they are subject to easy fracture because they are so porous and thin. Fractures of the spine and hip are of greatest concern since they almost always require major surgery, prolonged hospitalization, and lengthy rehabilitation. Complications that can occur as a direct result of a hip or spinal fracture, as well as the forced inactivity that is part of the recovery process may lead to permanent disability and death. As further osteoporosis definition, there is another way to explain this problem that is far from being literally accurate but rather very descriptive in terms of what happens to the bones when osteoporosis occurs. Think of osteoporosis as something like a strong oak tree developing a loss of wood density and hardness. In this situation instead of the oak having dense, strong and heavy limbs, the wood becomes much less dense and therefore less strong. It would be like oak wood turning into softer, lighter, less dense and weaker pine wood. If this problem would develop in an oak tree the limbs could withstand high winds and heavy loads of snow; the limbs would break easier and result in related health problems for the tree. Spinal pain in general and low back pain in particular is a rather common pain condition around the world, with a variety of causes. Many times this spinal pain is due to osteoporosis. Fortunately, there are many things preventive measures that can be taken to reduce back pain when it does occur and to prevent the chances of developing a painful back problem. Good nutrition is a fundamental contributor to a strong and healthy bones and a pain-free back. It should be obvious that what we eat has a direct impact on our health in general; this also applies to connective tissue health and bone health. With a prolonged and repeated lack of proper mineral intake (calcium, phosphorus, magnesium) and protein intake (meat, fish, eggs and dairy) the bone tissue will be weakened, eventually resulting in osteoporosis. All bones – spinal bones – are a rigid and dense kind of connective tissue. They are very slightly flexible to absorb impacts and shocks without breaking (made possible by the protein that is found in bones), yet strong and hard to carry weight and give structure to the body (made possible by the calcium, phosphorus and other mineral found in rocks). Because of this similarity these soft and hard forms of connective tissue suffer from poor diet. So in this way we see that the osteoporosis definition that applies to bone, also applies in related ways to connective tissue like the discs that complicate and worsen the problem of low back pain. Good diet is important to good skeletal health because there is more to bone tissue than minerals. While calcium, phosphorus, magnesium, strontium, manganese and vitamin D and a few others take care of the nutrient needs of bone, a great amount of protein is also found in bones. If a vitamin D deficiency is present it can prevent the minerals from entering the bone tissue to make them strong and stable. These minerals and protein must be supplied on a daily basis for good bone health. The protein part of bone holds the mineral part of bones together and offers a matrix of support into which the minerals are deposited. This is why certain unique nutrients, minerals and protein are needed for normal healthy bone density as well as healthy connective tissue throughout the body. The spine is made up of 24 moveable bones that are kept both flexible and stable because of the muscles, tendons, ligaments, cartilage and intervertebral discs that are considered soft connective tissue. These same nutrients, minerals and protein also are needed for healthy and pain-free muscles, ligaments, tendons, cartilage and spinal discs because they support and give structure to the spine. So what you eat definitely can impact, positively or negatively, on the health of the spine and how it feels each day as we go through life.